I have mentioned a few times over the course of this blog that I am a bit of a map junkie. As far as I can tell, this goes all the way back to my 6th grade year back in Sonoma County when my teacher, for some reason unbeknownst to me, assigned me the task of “overseeing” the production of a large, wall-sized map of the world. The project definitely had an impact on me, and the love of maps and geography has been a constant ever since. Those who have been in the study in my house can attest to the fact that I am a bit obsessed. However, between my passion for the outdoors and my writing endeavors, I have found a legitimate outlet for my cartographic interests. It may not be obvious to everyone, but this website is largely map-driven. The locator map on the front page has been a fixture on the site since the very first day. All of the trails I have posted on here obviously include topo maps to illustrate the route and identify landmarks. Behind the scenes, many of the more obscure trails and a number of the Seldom Seen articles began life after I had pored over maps, looking for places to explore. Maps have also played a prominent role in my slow-developing geography series “Breaking Down The North State”. Aside from the US Geological Survey (USGS) topographic maps, the maps that I continually refer back to are the geologic map of California and, to a lesser degree, the ecoregional map of California. These are exceptional resources to anyone interested in the outdoors, whether for scientific pursuits or recreation. Throughout the development of this site, these have been invaluable tools that I have referred back to repeatedly. They proved even more important when I began writing my books. There are not too many good books that decipher the complex geology of California and even fewer are really accessible. Fortunately, observation of the natural world coupled with these maps made understanding the geology and geomorphology of both the Mount Shasta region and the North Bay much, much easier. After having employed these tools for a few years now, I figured it was high time to share them with others. This map is the product of a joint effort of state and federal agencies that include the USGS, the US Department of Agriculture (departmental home of the US Forest Service) and the California Department of Fish and Game. The map covers the entire state and uses colors and shades to distinguish different regions. While geography plays an important role in differentiating these regions, environmental factors such as weather, biodiversity and geology are also major influences. 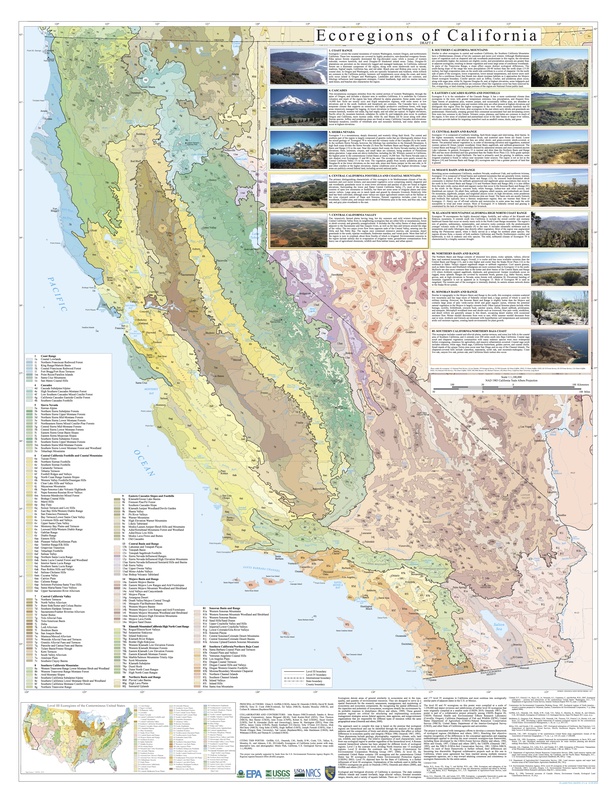 The end result is a map that illustrates the major physical regions and features in California. The Coast Ranges, Central Valley, Cascades, foothills, Sierra Nevada, Transverse ranges and deserts are all included here. Further differences in the map’s color shading break down subregions within the larger regional category. This helps isolate particular areas and identify what the dominant ecosystem is. Keddie Ridge is the northernmost point in the Sierra Nevada. Indeed, the real beauty of the map is how easily it distinguishes between these different areas. Many of the geographic divisions in California may seem arbitrary or are, at best, indistinct. Perhaps the most infamous is the line that divides the northern end of the Sierra Nevada with the southern end of the Cascades. Others, such as the scope of the Klamath Mountains and the boundary between the Sierra Nevada and the Transverse Range are also readily identifiable. This map has good detail and has a lot of information on it, but it makes a great quick reference for figuring out what is where in California. 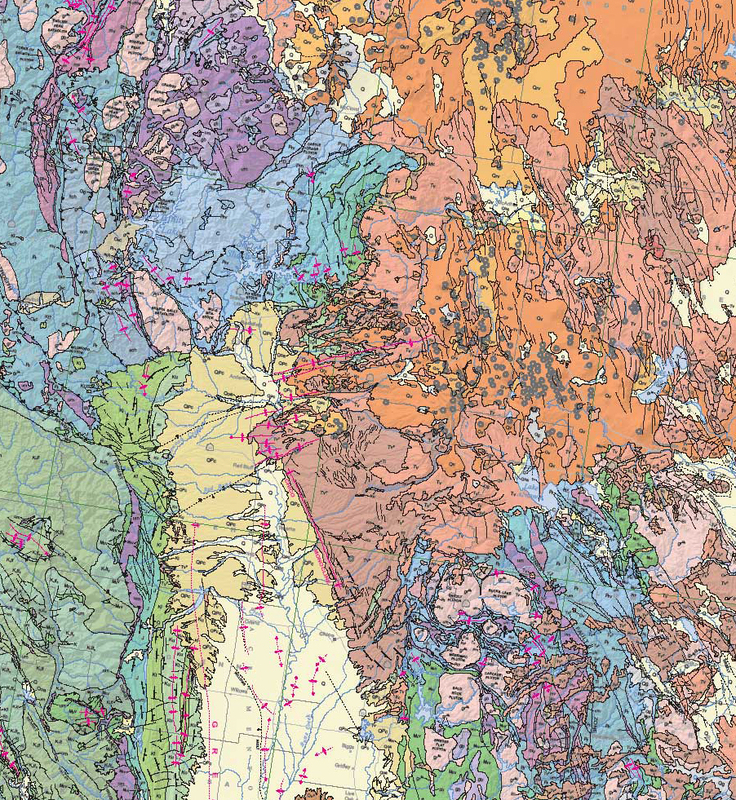 A panoply of color, the geologic map of California is as much a work of art as it is a resource. This visually stunning map displays the rock composition of the entire state. It was produced by the California Geologic Survey, an organization which has its illustrious roots in the 19th century survey of California. This initial group included exploration luminaries William Brewer, Clarence King and Charles Hoffmann. The exploration of Mount Shasta was part of their task and many landmarks in this area are named after them (including Brewer Creek on Mount Shasta and a pair of Mount Hoffmanns, one above Medicine Lake, the other near Lassen Peak). The current edition of the map was produced on the 150th anniversary of the completion of the first map of California. The amount of information on this map is simply staggering. Every rock type throughout California is represented here. Even isolated protrusions and batholiths appear in the proper place. This brings incredible clarity to why particular mountain regions or other types of areas are considered distinct from adjacent territories. While it may not explain the process that brought about bizarre shifts in rock type, it does succeed in placing them in a larger context and helps outdoor enthusiasts with even a rudimentary understanding of geology appreciate the sights they are enjoying. I think evaluating a few examples might be helpful in illustrating this point. As mentioned previously, one of the classic questions is the boundary between the Sierra Nevada and the Cascades. When driving along Interstate 5 and looking to the east, there does not seem to be a clear divide in the highlands that line the Central Valley. It all seems like a single cohesive uplift. Furthermore, while traveling through the mountains, there does not seem like a clear break between the mountains. Some accounts include Lassen in the Sierra Nevada, or claim that Lassen is its own entity, separate from both the Sierra Nevada and the Cascades. However, looking at the geologic map, it is clear that the rock types that compose the Sierra Nevada come to an end at the depression that contains Lake Almanor and that the volcanic rocks that compose the Cascades begin on the north side of the lake. Volcanics intrude on the Sierra Nevada and Klamaths. 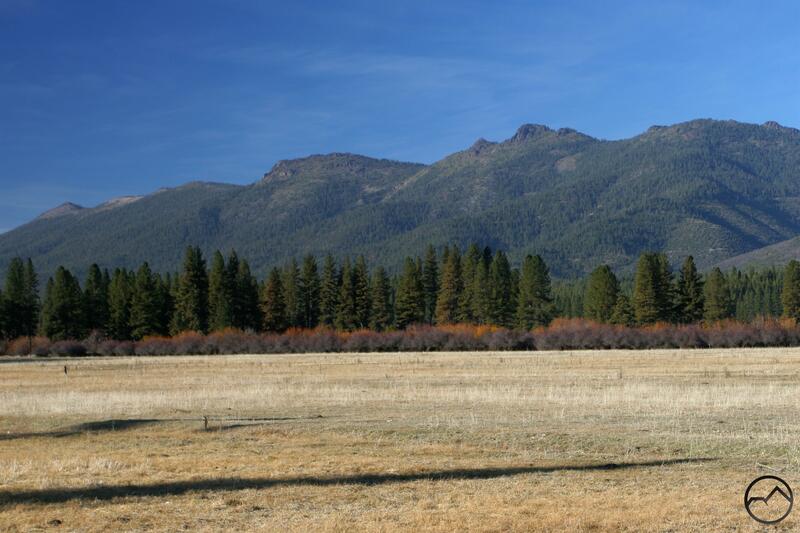 Another fascinating case is the similarities between the Sierra Nevada and the Klamath Mountains. It is often repeated that the Trinity Alps “look just like the Sierra”. Some books, such as the Roadside Guide To California Geology, contend that the Klamath Mountains are in fact a piece of the Sierra Nevada that broke away from the main core of the range due to tectonic shifting. It certainly is the case that the heart of the Trinity Alps, or even other nearby mountains like the Castle Crags do seem like twins to the classic granite environments of the Sierra Nevada. 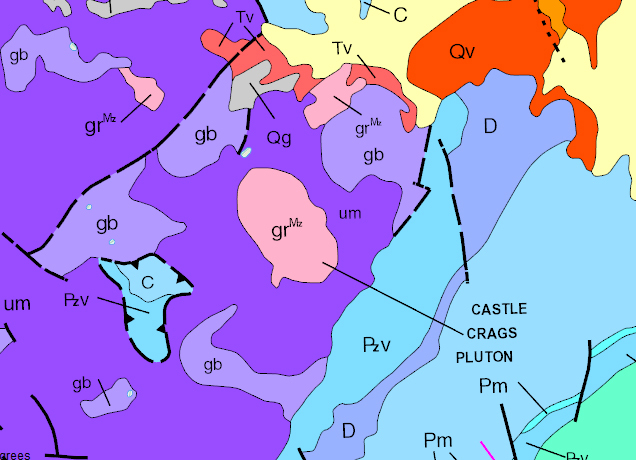 Looking at the geologic map, it demonstrates the reason for these claims. The Klamath Mountains do indeed match the rock composition of the northern Sierra Nevada. Both are composed of marine sediments interspersed with ultramafic rocks that are highlighted by large granite plutons. Looking at the map, it does seem like a large series of volcanic eruptions invaded the area and cut the Klamaths off from the rest of the Sierra Nevada. Perhaps a couple more specific local examples might be helpful to further illustrate these points. The Castle Crags have already been mentioned but deserve a second look. These towering granite spires burst from the dark forests in dramatic fashion, dominating the landscape south of Mount Shasta. However, they are the only occurrence of this “Sierra-type” granite in the area. The surrounding mountains are composed of different rocks. Some of the rocks resemble granite but have an obviously different chemical composition. 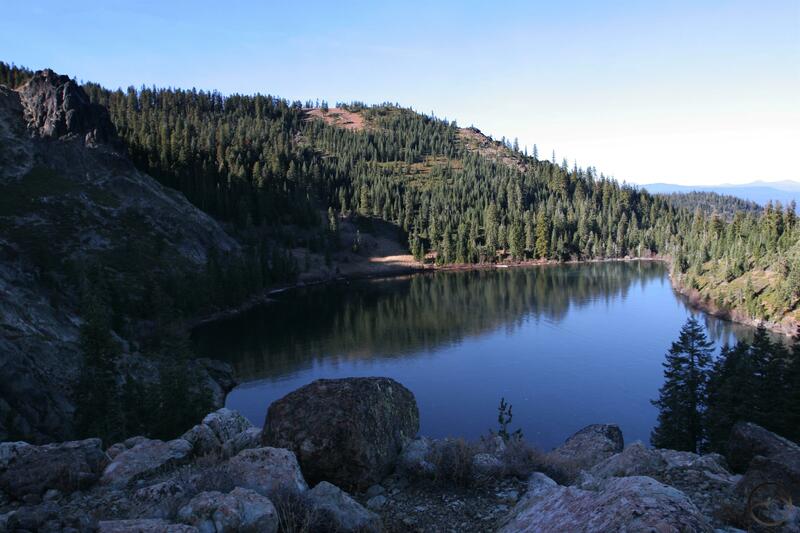 The cliffs above Castle Lake are one example of this. Composed of gabbro, it appears granitic, but its grain and feel are somewhat different. Even more distinct are the rocks just to the north, which, while still part of the same mountain range, are very different. The red rocks of the Mount Eddy are ultramafic, which are marine in nature and not created by the volcanic processes that produce granite and gabbro. 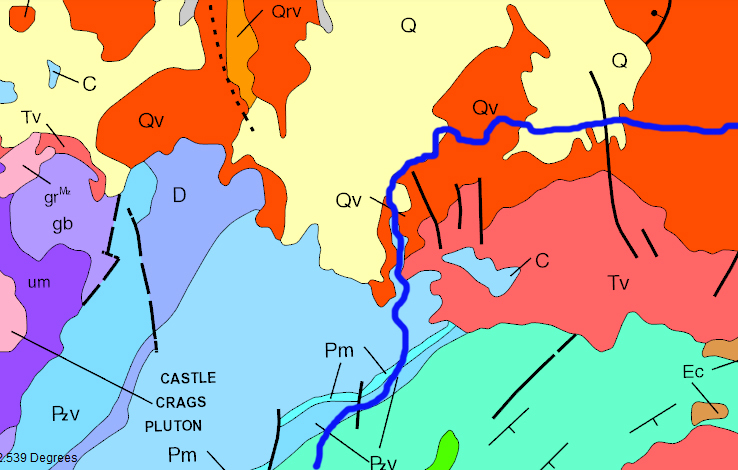 The map indicates this distinction and reveals that the Castle Crags are indeed an intrusion of granite distinct from the surrounding rock types. This is similar to the massive granite bulge that formed the lofty heart of the Trinity Alps, as well as other granite areas in the region such as the Russian Wilderness. 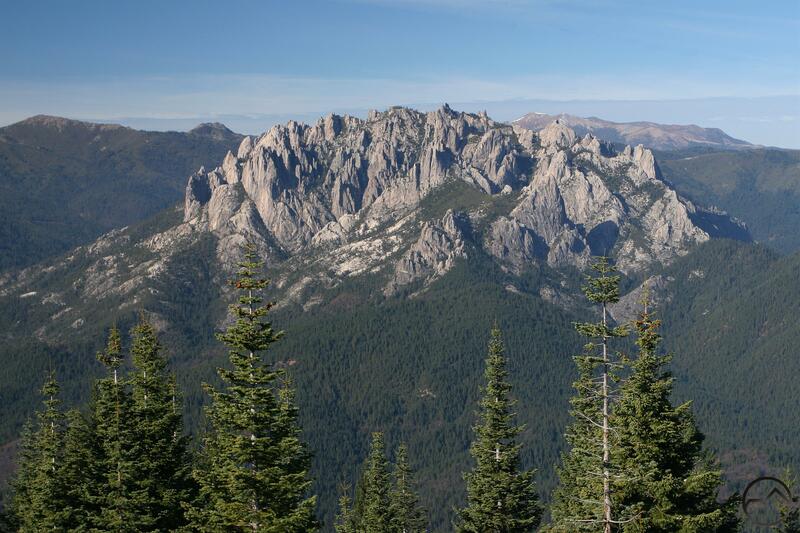 The Castle Crags are an isolated granite pluton. McCloud River highlighted in dark blue. Another interesting, if more subtle, geologic feature that pertains to the McCloud River is explained by the map. The McCloud is one of the primary waterways in the Mount Shasta area, famed for its fantastic fishing and excellent waterfalls. The latter in particular draw attention from hikers. The volcanic nature of this area is readily evident. Lava flows, columnar basalt and other evidence of its eruptive history are obvious. However, below the famed falls, the river enters private land and then is impounded by a reservoir. Downstream from the lake, the river is dramatically different. It races through a steep, deep canyon, pouring over large boulders but lacking the notable waterfalls. The difference comes from the fact that the Upper McCloud passes through volcanic areas, but around the area of the lake, the river passes into a region where the rocks are composed of marine sediments. While this change is not dramatic like the soaring Castle Crags, it nonetheless changes the demeanor and appearance of the McCloud River. The volcanic Upper McCloud River is very different from the marine sediment canyon of the lower river. 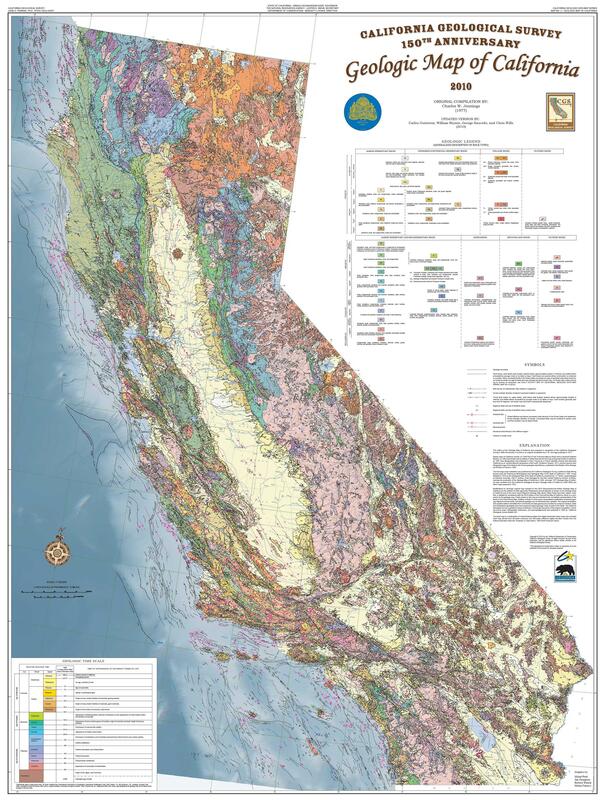 Not only is the geologic map of California available as a great jpeg file, it is also online. This map is also interactive and will identify the rock types when clicked upon. This makes looking at the key unnecessary. As if this was not enough, the USGS has its own version of the geologic map, but it is for the entire continental United States! Welcome to the time sink! I hope these resources help everyone appreciate and understand the things they observe while hiking. I’m happy at least one hiker is patient enough to try and decipher geologic maps! It’s of course difficult to get down to hiking trail-scale with a state-wide map. 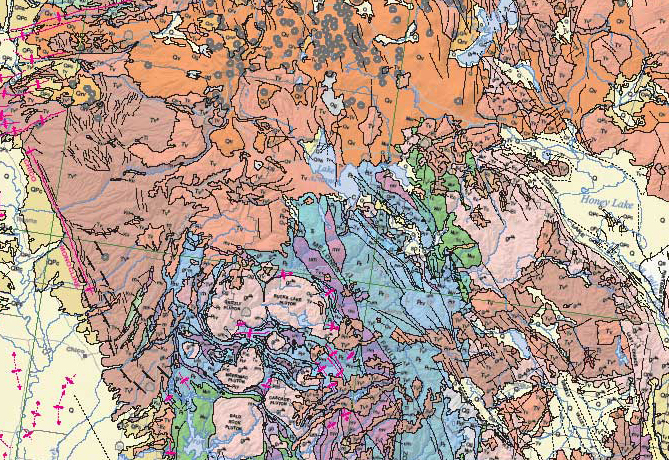 For that you’d need regional or quad-scale geologic maps, which I’m sure are available through the CGS or USGS. Always remember to look at ages and the faults and other structures when you’re looking at reasons for, say, the separation of the Sierra Nevada and Klamaths, as related to Cascade volcanism. Great post! Also, gabbro and ultramafic rocks are often very closely related to each other, whereas granitic rocks tend to occur in different environments. The fact these are close to each other in NoCal is testament to the juxtaposition caused by accretion. I am glad you liked it too! I spent a fair amount of time checking out my old stomping grounds in Texas on the national map. I really appreciated the contrast it drew between the Llano Uplift and the rest of the Edwards Plateau. That brought a lot of clarity to the places I hiked (or 4×4’ed as it may be out in Katemcy) while I was in school out there. Same for the Wichitas; an island of granite out in the plains. I appreciate the focus on maps. I am quite fond of them myself! My wife and I have a large map where we pin the places we’ve hiked, and although I don’t make maps a huge part of my blog, I take my GPS coordinates very seriously. They are (in almost every case) dead on the trailhead for a posted hike. So thanks for your mapcentricity!